More virtual cockpit development renders have been posted from the Let L-410 Turbolet project for X-Plane. XPIH has updated the freeware Cork Airport (EICK) scenery for X-Plane 9 & X-Plane 10. Download at X-Plane.org. Khamsin Studio has released the Pacific Islands Munda Airfield (AGGM) scenery for X-Plane 10 and X-Plane 9. Virtavia has added new preview screenshots from the upcoming Douglas A-4F Skyhawk for FSX at the Product Page. VertigoStudios has released the Boeing Stearman 'Kaydet' PT-17 for FSX. Details and purchase at the Product Page. - As with every Vertigo Studios aircraft, it is gorgeously constructed, inside and out. - Both the N2S and 300 boast a 3d Prop. - 3D lights for the ultimate realism. - Both models come with Hi-Def textures and also 2048 textures sizes. - Designed and built by the book. - Comes complete with a comprehensive PDF manual (printed for the retail box version). - DirectX 10 compatible models complete with virtual cockpit self-shadowing. - Systems and Tru3D gauges for ultimate realism taken beyond what’s available by default. - Tru3D Instrumentation for the ultimate smooth flying experience. - Customised high-resolution materials give the most realistic appearance to the aeroplane, whilst being optimised for great performance! - A total of 15 paint schemes included with an additional 5 paints available via our downloads area. - Light bloom on glass and shiny materials. ScanSim Fly to Copenhagen Airport (EKCH) Version 3 for FSX, FS2004 and P3D is now available at SimMarket. - All Terminal buildings updated, with lots of details. - Oresund bridge with Artificial island & tunnel on the west side, & realistic ground on the east side. - Realistic Saltholm island with new seasonal and night textures, & 3D buildings. - Barseback Powercraft with Photorealistic ground. - On the Swedish side the Turning Torso building has been added in Malmoe city. - Special light effects at night in Copenhagen City. Simbreeze has released the Tenerife South - Reina Sofia Airport (GCTS) scenery for FSX. Available at SimMarket. TropicalSim has released the Aruba Queen Beatrix International Airport (TNCA) scenery for FSX, FS2004 and P3D. 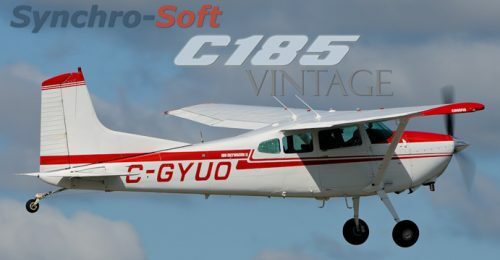 Synchro-Soft has released the Vintage Cessna C185 Soundset for FSX. Available to purchase at SimMarket. The recently released Alabeo Cessna 188 Crop Duster for FSX is now also available to purchase at SimMarket. Taburet has released the Nuremberg Photorealistic scenery for X-Plane 10. Now available to purchase at SimMarket. QualityWings has posted the first preview screenshots from the upcoming FSX version of the 146/Avro RJ Collection. The Project Airbus Team has posted more teaser screenshots from the upcoming Airbus A330 and A340 aircraft family. Navigraph NAVData AIRAC Cycle 1207 is now available. Purchase Credit Packs at Navigraph or SimMarket. LatinVFR has released Cozumel International Airport (MMCZ) for FSX and FS2004. Now available at SimMarket. - MMCZ (CZM) airport completely modeled with significant attention to detail. Just Flight has posted details and preview screenshots from the upcoming Douglas DC-6 Cargo Expansion Pack for FSX. Godzone Virtual Flight is currently offering Real NZ Wellington and Tauranga for only $10 each. Valid until July 31st 2012. FlyJSim has posted more instrument panel development renders from the upcoming Boeing 727 Series for X-Plane. Flight One Software is currently offering $15.00 off the Cessna Citation Mustang for FSX as the Weekly Special. Drzewiecki Design has posted development previews from the New York City 2013 scenery currently under development. - 2D windows: Field of view, door manager and general options for controlling cargo pod, statics elements and VC windows transparency. - Highly detailed animations, such as doors, ladders, fully articulated sun visors, etc. AivlaSoft has updated Electronic Flight Bag (EFB) to version 1.34. More information at the AivlaSoft Website. Aerosoft has updated the freeware Mitchell Wing for FSX. Details and download in the Aerosoft Forums. Aerosoft has updated the Rockwell OV-10 Bronco for FSX to version 1.1.2. Available at the Aerosoft Shop and SimMarket. Abacus is offering 17.76% discounts on all titles during the Independence Day Sale. Valid through July 6th 2012. Aerosoft has released the freeware Mitchell Wing for FSX. Download in the Aerosoft Forums (Registration Required). 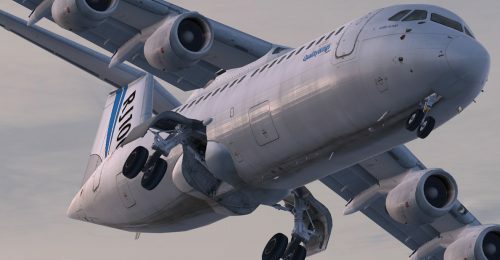 Ben Supnik has posted a status update on the upcoming version 10.10 of X-Plane on the X-Plane Developer Blog. 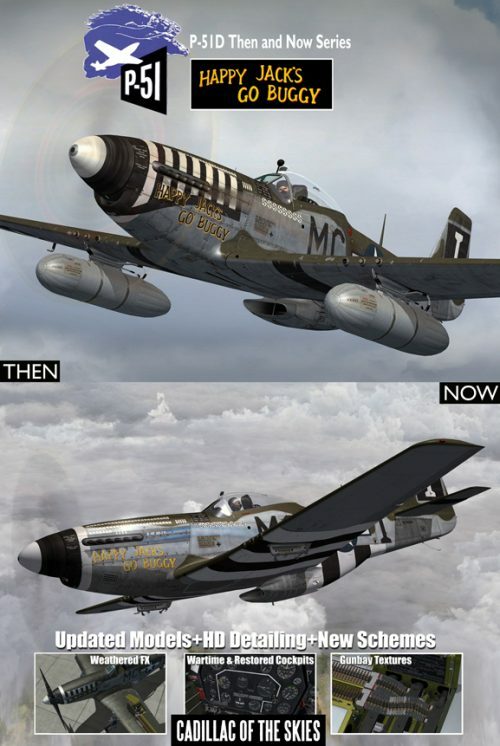 Warbirdsim has released the North American P-51D Mustang 'Happy Jack’s Go Buggy' Then and Now Series Part 3. TropicalSim has announced development of Aruba Queen Beatrix International Airport (TNCA) for FSX and FS2004. More previews have been posted from the upcoming RAZBAM McDonnell Douglas AV-8B Harrier II for FSX. Aviation Multimedia Studios (AVS) has released the Cancún International Airport (MMUN) scenery for FSX. - An incredible and fantastic Cancún representation with all surrounding areas. Totally re-designed since FS9 version. - High resolution aerial and re-digitalized photoreal textures. On the airport and ground textures over all Cancún Area. - Ground Specular, RAIN EFFECTS and Bumps Textures. - Ground Traffic animations on the airport, freeways, hotel zone and City. - Fully operational Aircraft Bridge. - Smooth and detailed taxiways, lines and appron areas. - Stunnings and the best Night effects. - A whole representation of Hotel Zone. - 3D Surrounding areas with a re-worked shore, Cancún city and ISLA MUJERES Airport and Island. - A lot of airport vehicles animations. - And thousands and thousands of details. The freeware Tokyo scenery for FSX has been updated to version 2.80. Download at the Authors Website. Sim Skunk Works has updated the McDonnell Douglas AV-8B Harrier II for FSX to V1.0.1. Details at the SSW Website. The Project Airbus Team has posted more screenshots from the upcoming Airbus A330 and A340 aircraft family. MilViz has posted new preview teasers from the upcoming North American F-86 Sabre for FSX on the Facebook Page. 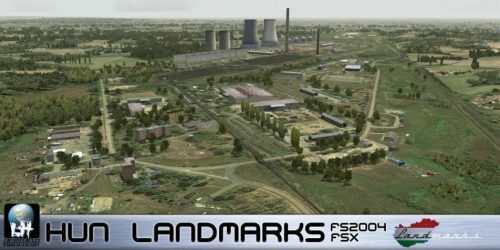 LHSimulations has posted previews from the next version of the freeware Hungary Landmarks Pack for FSX and FS2004. Orbx has released the freeware West Wind Airport (7WA3) scenery for the FTX North America PNW region. Lionheart Creations has posted more screenshots from the default Mooney M20 in the upcoming version of Prepar3D. More preview screenshots have been posted from the upcoming version 2.3 update to Ground Environment X Europe. Hervé Sors has released Navaids Update 1207 for FSX and FS2004. Available at the Flight Simulator Navaids Page.